My boys love making these cookies so they can choose whatever shapes they like. They are great for birthday parties and lunch boxes. 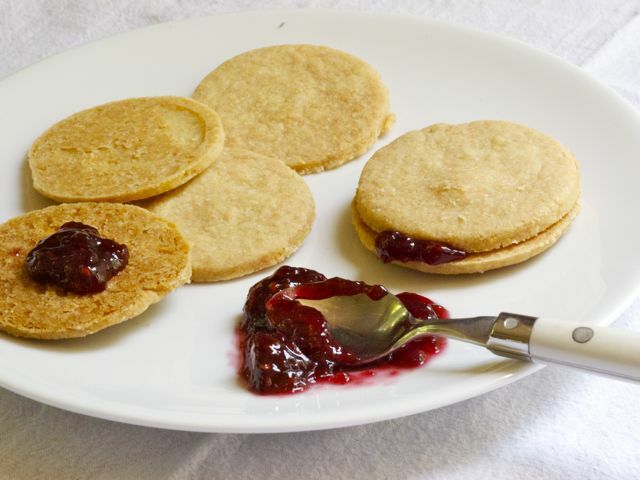 They are also good sandwiched together with raspberry jam! Place all the ingredients in a food processor and whiz until the mixture almost comes together and resembles coarse breadcrumbs. Then tip the mixture onto a work surface and bring it together with your hands. If you are not using a food processor, rub the butter into the combined flour and sugar in a bowl and bring it together with your hands. Sprinkle your work surface with a little flour (wheat or white) and roll out the dough until it is about ¼-inch thick (or roll it between two pieces of plastic wrap). Using a cookie cutter, cut the dough into whatever shapes you like, or just simply into squares with a knife. Transfer onto a baking sheet (no need to grease or line it) and bake in the oven for 6 to 10 minutes depending on the size, or until the cookies are pale golden and feel firm on top. Remove carefully and cool on a wire rack.